HONG KONG, Dec 12, 2018 - (ACN Newswire) - Blockpass and Infinito Wallet have announced the launch of the world's most secure and convenient KYC-enabled security token wallet, providing regulatory compliance while putting traders in full control of their security tokens. The wallet is an integration of the Blockpass KYC Connect solution and the world leading universal wallet. As can be evidenced in a spate of recent partnerships and developments, Blockpass believes that the future of decentralised trade - and therefore the future of all trade - lies in the exchange of securities tokens. Infinito Wallet, in its desire to provide the most versatile and innovative cryptocurrency wallet, is committed to supporting securities tokens as the upcoming innovation to transform markets. Through their partnership, Blockpass and Infinito Wallet will bring easy access to securities tokens and other Blockchain services as they enter into mainstream adoption. Infinito Wallet is the world's leading universal mobile wallet, a single safe place for all types of major coins and tokens. Currently it supports BTC, ETH, ADA, EOS, NEO, ONT, LTC, BCH, ETC, DASH, DOGE, along with GAS, ONG and all tokens built on ERC20, NEP-5 and EOS with more to come based on the roadmap. Users can register to easily manage tokens that require KYC Profile with Infinito Wallet, and even apply to enjoy other blockchain services. Currently, Infinito Wallet has been downloaded by more than 300,000 users globally and has received positive reviews from the blockchain community. It can serve not just as the most powerful, secure universal wallet service for leading coins and tokens, but also a crypto wallet that offers many free rewards to users worldwide. Infinito App Square is a built-in DApp marketplace where users have seamless access to a wide range of innovative DApps and blockchain services. Blockpass is a digital identity application and service that brings control back to the user. Blockpass provides a streamlined and cost-effective user onboarding process for regulated industries and any kind of online service. From the Blockpass application, users can create, store, and manage a data-secure digital identity that can be used for an entire ecosystem of services or token purchase. "Today's announcement with identity system leader Blockpass is another solid step in building our authority in the security token space and consolidating our position as leader in the cryptocurrency wallet ecosystem. 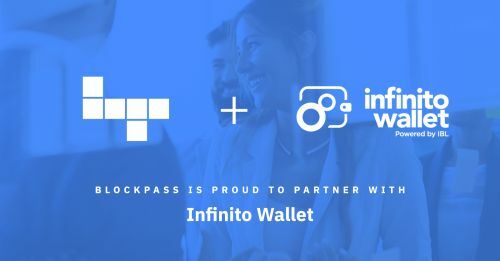 Partnering with Blockpass will allow Infinito Wallet users to store, send, receive and utilize their security token," said Jack Thang Nguyen, Project Director of Infinito Wallet. Adam Vaziri, CEO of Blockpass, said: "Security tokens continue to be the focus of discussions for the cryptocurrency and blockchain ecosystems and we are committed to improving access to this promising technological development. Our longstanding partners, Infinito Wallet, were perfectly suited to work with us to provide this regulatory compliant solution which will give users control in such a vital area. We are excited to be at the forefront of the security token revolution." Positioning as a leading universal wallet for crypto users, Infinito Wallet serves as a gateway for users to maximize usage and potentials of their cryptocurrencies. By selectively expanding our partner network, Infinito Wallet aims to build an ecosystem of practical blockchain services including exchanges, ID/KYC solutions, and other blockchain-related business services. At the same time, we help support communities of developers and businesses with an open blockchain infrastructure of technologies and compliant-ready services, so that they can seamlessly build, launch, and operate innovative products and services efficiently. Infinito Wallet's core development team of blockchain R&D experts has intensive professional experience. Currently, our organization consists of more than 300 members including developers, designers, business and marketing specialists. We are promoting research on infrastructure for cryptocurrencies and developers utilizing blockchain.